The award-winning M57 Mobilair™ portable compressor. This 45 hp unit delivers 210 cfm at 100 psig – the competition doesn’t even come close! Plus, it’s the longest-running portable compressor in its class with the largest fuel tank. The power-saving Sigma Profile direct drive airend combined with an oversized fuel tank provides 10 hours of uninterrupted operation. The heavy-duty 4-cylinder diesel engine with cold-start battery ensures reliable operation even in severe conditions. The solid steel floor and panel insulation greatly reduces noise levels. The powder-coated enclosure with gullwing doors provides easy access to all service points and the large toolbox. The torsion bar suspension system and oversized tires provide excellent road handling. The versatile M57 provides all the rugged durability and heavy-duty performance you need. 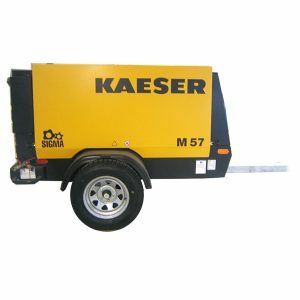 For more information on the M57 or our wide range of portable compressors, accessories or MobilairTools, please call Miles Supply!